On my journey to heal my leaky gut and cure my food allergies, I’ve been gorging on paleo cookbooks. There seem to be plenty on the market these days… it’s quite trendy to “go paleo.” I’m enjoying (parts of) the process of exploring the paleo tenets, only consuming quality meats, vegetables and fruit; avoiding gluten, dairy, legumes (beans, potatoes, soy, etc), sugar, alcohol and processed foods of any kind. It’s a challenging diet regime when you’re surrounded by temptations and creative food at restaurants. Powerful Paleo Superfoods, written by Heather Connell, provides a fantastic intro into the paleo lifestyle. Her 6-page introduction represents one of the finer, more condensed overviews of this popular diet, and proceeds to outline why each item on her list of “superfoods” should be on your plate plus recipes. In an easy to understand, not-so-science-y fashion. The recipes are simple to follow, use normal ingredients found at the grocery store and the photography is pretty fantastic. 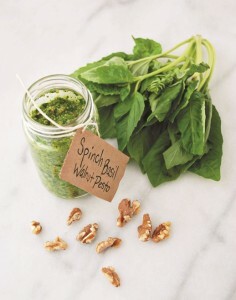 With permission, Heather allowed me to reprint this recipe for Spinach Basil Walnut Pesto. I use this on fish and chicken. The vitamin K in spinach can decrease the kind of inflammation associated with osteoporosis and heart disease, according to researchers at Tufts University— all the more reason why you should include this powerhouse green in your Paleo diet. In the bowl of a food processor, combine all the ingredients. Process, stopping a few times to scrape down the sides of the bowl. Taste and adjust the seasoning, adding more salt, pepper, or olive oil as necessary. Pesto can quickly add a different dimension to a dish with its amazing flavors. Have fun with this pesto by changing up the herb or even swapping the spinach for another leafy green. Bottom line: greens + herbs + nuts + garlic + olive oil = awesome!